This might sound a bit strange, but strange things do happen- like it is happening in Ahmedabad. 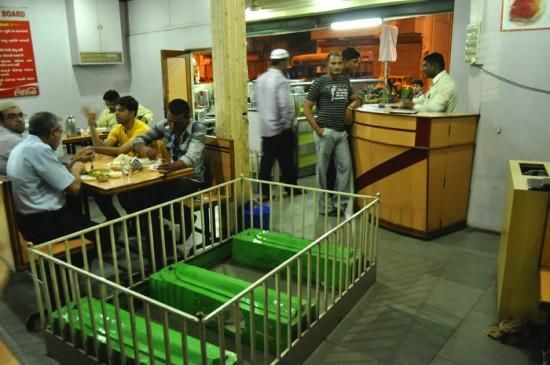 There is a restaurant in Ahmedabad, which is built on a cemetery and it has the presence of grave inside the restaurant. Ahmedabad is always in news for bizarre things which happens every now and then. But now, it has grabbed all the attention over the restaurant where people dine with the dead. Lucky restaurants (dine with the dead)- This restaurant is in the famous area of Lal Darwaza in Ahmedabad. A long time ago, this place used to be a graveyard. It belonged to the owner of this restaurant- Mr. Krishnan Kutti, who decided to keep the graves and do a sitting arrangement around the graves. He had no idea about how people would react and what would be the response to this kind of restaurant. This happened many years ago. So Lucky Restaurant is approximately 50 years old! The owner of this place and Lucky Restaurant, Mr. Krishnan Kutti believes that graves are very lucky for the business of his restaurant. If these graves would not have been there, then, maybe Lucky Restaurant would have never earned profits as it is doing today. Graves here are protected with iron grills and it is taken care of properly. In fact, even more than the customers coming in! Read Also – Now, You Can Legally Marry A Dead Person In This Country! There are dozens and dozens of graves lying inside the restaurant. These graves, greenish in color, shining bright, are said to belong to the relatives of the 16th-century Sufi saint whose tomb lies nearby. Every morning, before the restaurant re-opens, waiters clean the gravestones properly and worship or decorate them with flowers. This is happening every day for the past 50 years. Now, this restaurant is occupied by young and old people and its specialty is butter rolls. Earlier, due to lack of resources, it served people with only tea biscuits and rolls. But now, it is not like that. South Indian dishes are also served. The restaurant is divided into 2 sections, where the food served is separate. One section handles the tea department and other one handles the South Indian dishes. They say it right! Incredible India! Read Also – What Is The Reason Behind Placing Flowers On Graves?